If Internet users were looking for the simplest solution to mask IP, now they have found it. The reason they didn't find it until now because it has the solution has just been launched. 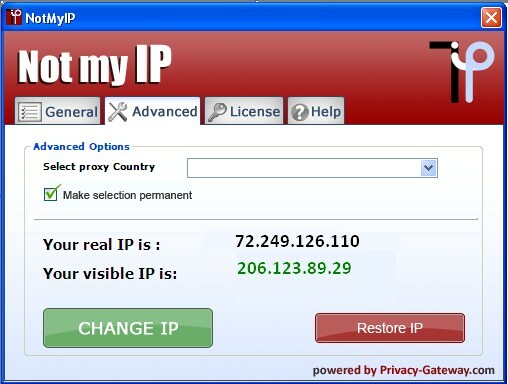 Not my IP, as its developers called it, is an extremely easy to use online privacy protection software that hides IP address while surfing the Internet. Plus, it is completely free! The time is accelerating and software has to keep up with the new rhythm, too. In order to efficiently use the software solutions, users are required more and more experience. Experience is gained by studying and using the software solutions. And these actions eventually require time. There is nothing wrong in acquiring more knowledge and experience, but the simplest and most efficient solutions can really help us focus on our primordial goals. This is the main philosophy that lies behind Not my IP. Privacy-Gateway released this solution aiming to be the simplest and most efficient way to hide IP. Considering all dangers Internet users face online and analyzing the increasing numbers of identity thefts, Internet surfers must have near by an online privacy protection tool. All of us need solutions to hide IP in order to browse the web anonymously, without worrying that we might be victims of online identity thefts. The simpler it is - the better it is! Internet users do not have to spend time learning complex strategies to achieve their purpose. They only want to hide IP. Is this too much they're asking? "Not at all!" thought Privacy-Gateway when started developing Not my IP. Only press one button and the real IP is hidden. A new (fake) IP will guarantee users anonymous web surfing while hiding IP. What can be easier that this? 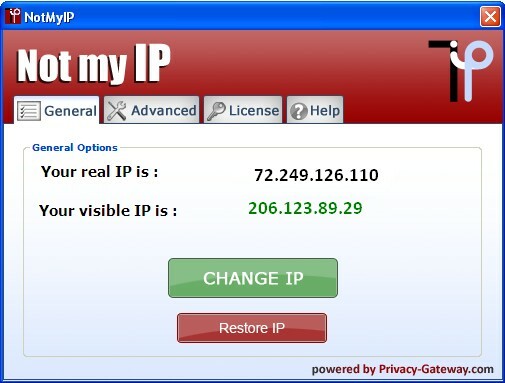 And to make it even better, Not my IP uses an exclusive list of premium proxies in order to provide a new IP. Convince yourself: download and install Not my IP. It's FREE!